The Stunning New LAMONT Oak Collection's soft curves and profiles creates a look that suits both modern or country living. 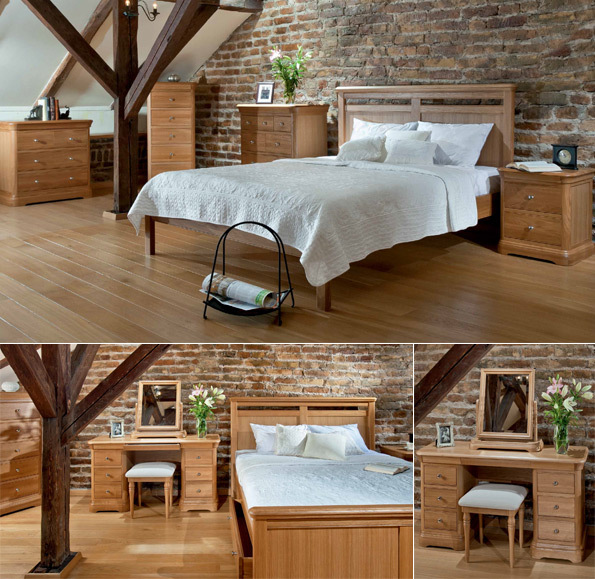 The Stunning New LAMONT Oak Bedroom Collection and LAMONT Oak Dining Collection are designed and produced by leading Lithuanian furniture manufacturer TCH Furniture Ltd.
All oak furniture manufactured by TCH is crafted from the finest European oak sourced from sustainable and responsibly managed forests. All prices listed are for Oil or Lacquer finishes. A stunning furniture collection featuring signature curves and profiles which evoke a traditional French style yet when combined with oak and nickel handles gives a fresh look that suits both modern or country living. All Wardrobes and Beds are supplied in knock down format. (Full assembly instructions are included). We are one of the countries leading importers and distibutors of TCH products and are pleased to advise on any of their products. Please call David on 01920 464982 (mobile 07778 627783) or email us for any help or assistance we can give. The dining collection has been designed with soft curves and profiles which evoke a traditional French style yet when combined with oak and nickel handles gives a fresh look that suits both modern or country living.